After upgrading Transmission on my ReadyNAS Duo from 2.33 to 2.42, the dark-green bar that showed seeding progress is no longer present in the Web UI. I've seen on the forums that others seem to have the same problem, but haven't found an appropriate ticket here in the tracker. I tested it in Safari 5.1.1, Firefox 6.0 and Google Chrome 15 on Mac OS X Lion, with same results. ratio.patch​ (2.1 KB) - added by cfpp2p 7 years ago. ratio-rfsh.patch​ (2.3 KB) - added by cfpp2p 7 years ago. global-seed-ratio-bars-in-web-client-svn-r13276.png​ (82.4 KB) - added by jordan 7 years ago. ratio-rfsh-052112.patch​ (2.3 KB) - added by cfpp2p 7 years ago. Additionally, as we commented on the forum, the seeding bar sometimes appears if you select the torrent, other times not even selecting makes it appear. From version 2.40 to 2.42 it got worse, it takes more time and/or opening/closing the detail. Tested with Firefox 7.0.1 and all recent preceding versions. Also IE 8, same weird behavior. And you definitely need to open the inspector or the seed portion of the bar doesn't appear when you select a torrent. Also the "remaining time" text only appears when selecting the torrent (and the inspector is showing). Fixed in r13082. Thanks for reporting this! Here is patch to fix the variation. I'm sure the devs will clean it up if needed. Also there are refresh problems but the issues with refresh, by my testing, were pre-existing and are not related to the patch. Patch works good for all cases of seeding progress bars. jordon: verified that the correct patch is attached. Thanks for letting me know, I think I somehow attached twice by mistake. Patch updated to correct issues with inactive torrents not being refreshed when the seed ratio preferences are changed in the web client's preferences dialog. Why is PrefsDialog invoking Transmission.initializeTorrents(), which is a function previously only called from Transmission's constructor, and which asks the server to re-download all the torrents' metadata + stats? Why is PrefsDialog invoking any Transmission methods directly; those calls could be moved to Transmission.onPrefsDialogClosed()? Why was Torrent.seedRatioLimit() changed to ignore torrents that are set to seed forever regardless of the global setting? Why is PrefsDialog being referenced as the data store at all? Are the values in Transmission._prefs incorrect? I hope this helps you with your confusion understanding the code. I spent quite a bit of time with the patch so if anyone has free time to tweak it (it already works quite nicely), please feel free. What am I not seeing/doing here?. With r13271 I no longer see ANY global seed ratio bars, ONLY those with torrent specific ratios defined. 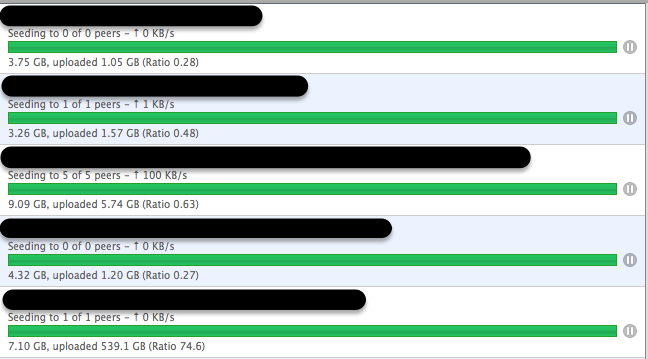 With my submitted ratio-rfsh.patch I am able to see bars defined by BOTH the global and torrent specific ratios set. Sorry but I don't understand how r13271 fixes the problem by eliminating showing bars for any torrents using the global seed ratio. If I am in error and not doing something properly please correct me and disregard. I've attached a screenshot of the global seed ratio bar behavior I'm seeing now. It looks correct to me, so my first guess is that there's a configuration issue on your end. If you find this to be in error, please reopen this ticket with more information on how to reproduce the seed ratio bar bug from a fresh checkout of svn trunk. Thanks! OK, working correctly in r13283, I just needed to get TRANSMISSION_HOME and TRANSMISSION_WEB_HOME both configured correctly for my setup. Thanks Jordan! for anyone interested, with v2.52 using the web-ui for global seed bar ratio changes, changes are not updated immediately when the torrent has no leechers. my old patch updated updated (to fix an issue with seed forever regardless of the global setting) is attached. Patch tested and in use for over 1 month.